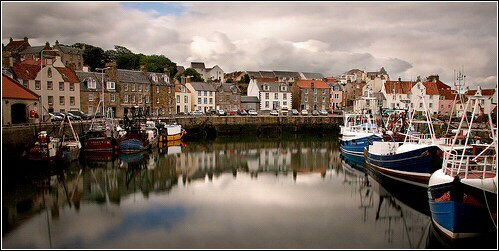 Looking around the East Neuk today you may wonder why it needs preserving. It’s hard to believe that only 30 years ago many of the older houses were ruinous and in danger of demolition or collapse. Since then with the Little Houses Scheme and improving purchasers, the historic buildings of the area have been saved for future generations. The focus of the Society has now shifted to protecting the unique character and charm of the area which has made it so popular with holiday makers and attracted new residents from all over Scotland. While planning laws now protect the buildings, their integrity is under threat from the encroachments of modern life. We reap the benefit of our predecessors’ hard work in safeguarding our beautiful surroundings, but the wonderful natural environment that draws people here in the first place has been put under pressure from developer-driven intrusions aiming to fill up every spare space with housing. The accessibility of the East Neuk as a holiday home destination has seen the housing market in the area boom in recent years. This has led to the loss of green space, gardens and local amenities such as shops, pubs, garages, churches even, as premises are converted into houses or flats. There are no longer any hotels in Elie, fish sheds have been lost from all the villages, boats are no longer built in St Monans. Work places and employment opportunities for residents are reduced, and shops struggle to survive where much of the village consists of holiday homes. Yet applications still come in for new developments of large numbers of characterless bungalows and houses with no thought of reflecting local vernacular style, and no consideration of the strains placed upon the existing and fragile infrastructure of the East Neuk, or where the new owners and occupiers will work or go to school. The separate and distinct identity of each village is under threat as houses encroach on the boundaries, with Pittenweem and Anstruther only one field apart, while Cellardyke and Kilrenny are almost contiguous now. We must be vigilant to make sure we preserve this beautiful corner of Fife and do not allow inappropriate new developments which will disturb this harmony, overwhelm the old village centres, and spoil the reasons so many wish to live and visit here. You can help maintain the charm of the East Neuk by joining the Society, to meet like-minded people, and comment on issues that concern you. If you would like to become a member of the East Neuk Preservation Society please print out and complete this form and post it to us.